Harley hasn’t attempted to create a modern-looking bike since the 2002 VRSCA V-Rod. And you can’t mine the past forever, even if parts of that past—the XR-750, for example—are very evocative. 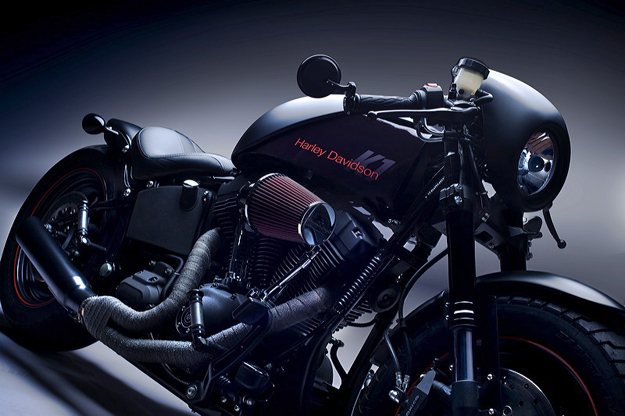 So I got to wondering, what should a cool, contemporary Harley muscle bike look like? I think the answer has got to be pretty close to this one, built by photographer Richard Krall. The bike is a 2007 FXSTB Softail Night Train with relatively subtle but very effective mods that transform the look of the machine. The biggest change that Krall made is at the front end, which now comes from a Suzuki 750 and will probably improve handling. The front wheel is a Harley Fat Bob slotted aluminum wheel, with an inch of hub material shaved off so it would fit between the Suzuki forks. The front fender and headlamp cowl are from a V-Rod, and Krall designed the fuel tank himself—using a hinged V-Rod airbox cover to allow refueling. The internals of the Harley Night Train’s 96ci engine are stock, but a Screamin’ Eagle Heavy Breather air intake and 2-into-1 D&D performance pipes boost breathing and horsepower. Krall had the wheels powdercoated black before adding a red pinstripe, and built the seat frame himself, using a local upholsterer for the finish. A chopped, lowered and re-contoured rear fender completes the look. To my eyes, it’s the best-looking contemporary Harley custom I’ve seen for a long time. What do you think?